A near-space scientific platform, FIDO is a refined version of what project GARI initially wanted to be. FIDO again uses the APRS network for tracking, but also acts as a sensor hub. The tracking system is entirely isolated from the rest of the platform. Using a PIC12F1572, a sparkfun Venus GPS, and the HX-1 transmitter, this APRS tracker is much more efficient than the system created in GARI. 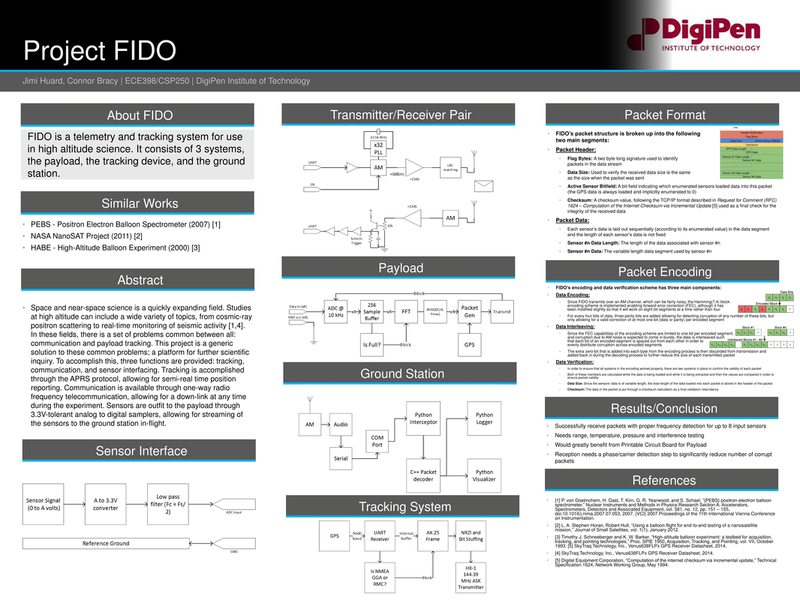 The platform component of FIDO is comprised of an ARM cortex M3, NXP's LPC1769. The current design will have an ADC interface, where analog sensors can be attached to FIDO, which are then sampled, packetized, and transmitted down to the base station. FIDO plans to have two way communication, so that commands may be issued mid flight to change the operation of the platform. The first iteration of the tracker has been created, and a small balloon test was performed. The device was successfully tracked until it was no longer air borne. Unfortunately, the payload did not get very high as the balloons used were previously inflated and the weather was quite inhospitable. The balloons seem to have popped early, causing the tracker to only travel a few miles. The results of the final project are outlined in the poster.